Senator Dede Feldman just returned from a national conference in Washington, DC, where she joined hundreds of women strategizing about how women can help change our national priorities and build a better future. "Women at the Table of Power" brought together luminaries, women state legislators, and women activists - all working to empower women to step up to the tables of power and make our country safer, more democratic, more respected. "We can change our national priorities. And women will set the course in a new direction." 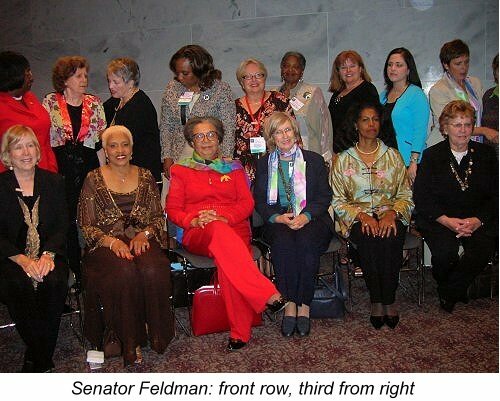 Sen. Feldman was one of 22 women legislators honored with the organization's Pacesetter Award. WiLL Pacesetters are recognized for their noteworthy legislative service, their contributions to sound, progressive policy, and their groundbreaking leadership in the states. Feldman was lauded for her environmental, consumer and health legislation. The Award was presented on October 1, 2007, at a ceremony on Capitol Hill that also honored Marian Wright Edelman, founder and president of the Children's Defense Fund. At the conference, women from across the country shared ideas and strategies about how to move forward toward greater peace and security. Among those speaking were Jane Fonda, Marian Wright Edelman (founder and president, Children's Defense Fund), Ellen Bravo (founder, National 9 to 5), and many more. On October 2, the women headed to Capitol Hill, where they visited Members of Congress and lobbied for better federal budget priorities and a fresh look at our national security. Activists Maria Santelli, of the Another Side Project, Ruth Koury, of the Pockets of Poverty Alliance, and Jessica Wilbanks, of Women's Action for New Directions, were part of the New Mexico delegation. "The staggering amount of money that we are spending for the Iraq war and a continued build up of obsolete weapons has its prince back in the states," says Feldman. "The opportunities that we are sacrificing can be counted in the number of children that will continue to live without health care insurance, and the number of people who cannot afford a decent home." So far the US has spent almost $610 billlion on the Iraq war. The cost to the taxpayers of New Mexico now totals $1.4 billion, according to the National Priorities Project. That's in addition to the 31 New Mexico soldiers who have paid the ultimate price, and the 245 who have been wounded. "We need to readjust our priorities to provide real security here," says Feldman. "$1.4 billion could have covered 136,000 New Mexico kids with health insurance." Feldman says she was heartened to join with women legislators from around the country who would like to see a shift of funding from military spending to helath and human services in their own states. "This conference gave me hope that women can help steer our community in a new direction. And we must do this. And it's not just the Iraq war, which is ruining our world standing and robbing us of our best and brightest young people. Our state, and our country, are seeing dangerous trends. Over the last few years, the current administration has chipped away at things that are vital to our country's peace and security. Today, we are more isolated in the world; our poorest are more at risk than ever; our economy grows weaker each day."